Deep-winter Trek to Mt. Kedarkantha - Ghumakkar - Inspiring travel experiences. A cold wind swept through bringing in its wake a flurry of ice crystals that stung my eyes. Biting sub-zero cold seeped through the balaclava and caressed my face. ‘Yes…that’s it…sabash…just a few meters more’ the guide’s voice floated through pre-dawn darkness. ‘Don’t look up or down just watch your steps’ the voice drawled on. But you can’t help looking up or down. I do. Dozens of climbers are shuffling through the deep indentations on snow and dozens more follow you; all bent over, panting and focused on the next foothold. From far, we might resemble a black sinuous snake creeping on the white snows of Mt. Kedarkantha. 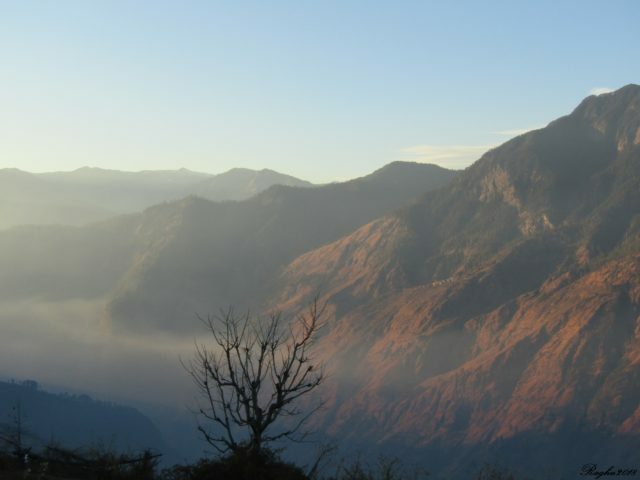 A few meters from the peak, the sun breaks out of the Gangothri ranges painting the climbers face with morning light. Exhaustion and fear gives way to relief and when you sit down on the slabs of rocks that form the summit there’s even elation. We have done it! We have scaled a peak! Sankri, as far as Himalayan towns go, is still in its adolescence. Veteran trekkers and climbers of this region recall how even a few years back the town was unstained by commerce. But today resorts and spa have cropped up. Café, Indie music and Karaoke signboards poke out of new concrete structures that have come up on both sides of a single road that passes through this town. But it’s not as bad as Mussoorie or Shimla! The nights are still quiet. You can hear the dogs bark. In the distant mountains, a ring of fire sweeps through pine trees, deliberately lit for creating grazing pastures in the summer. If you listen carefully, you could even hear the crackle of the fire and the explosion of pine trees – a distant thump, both mysterious and beautiful. The town has not gone to dogs, not yet! A three hour pleasant climb from this town through Pine and Fern forests leads us to Posla and to our first contact with snow. Pockets of dirty white clumps are scattered on leaf-strewn muddy ground. To walk on it and hear the crunch of ice crystals is great fun. But little do we realise that the crunch will be our constant companion for days to come. 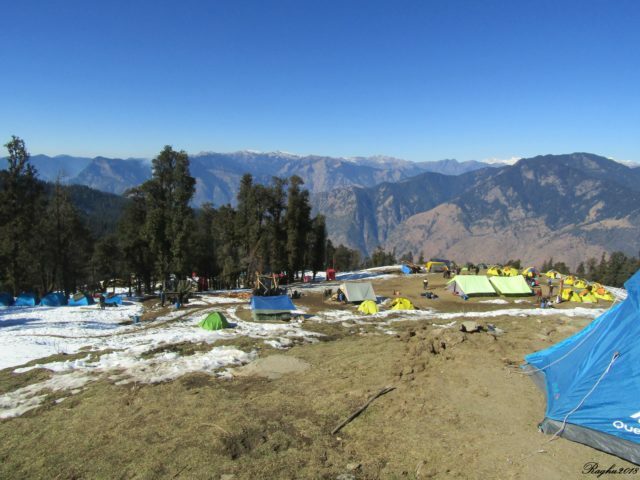 Posla, the camp site, is on a terraced hill overlooking some magnificent views of the Himalayan ranges. Villages cling to the dark, granite walls of these mountains like barnacles on a blue whale. Inky-black ravens, with their gravelly cries, and Himalayan Golden eagles, with their feathers rippling, cruise over the deep ravines. For a visitor like us these sights are quite other-worldly. Some of us may even confess a desire to stay in a place like this for months. But it is a tough place to live. I spoke to some native women who were harvesting peas on a terrace carved out of the mountainside. Medical facilities are almost non-existent. In case of emergency they have to go either to Mori or farther still to Dehradun. 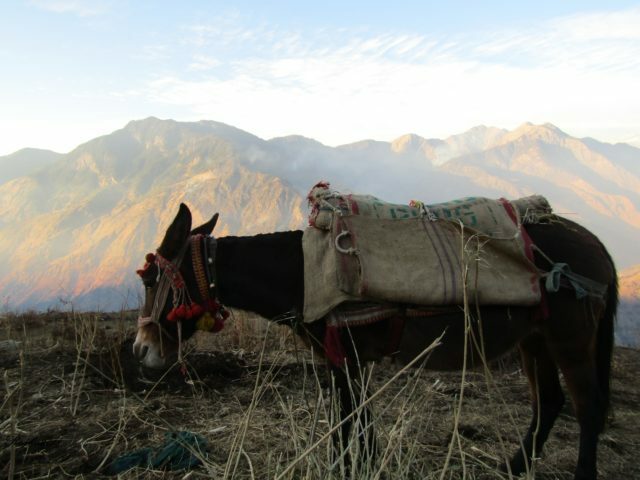 Transporting goods was still done the old-fashioned way; on mules. Higher education for their children was beyond the reach of most people. Despite these hardships, the people of this region are very pleasant. ‘Drop into my house…before you leave’ said the lady with a bright smile on her face as she handed me a bunch of pea pods. The evening descends quite rapidly and shadows crawl up and swallow villages. 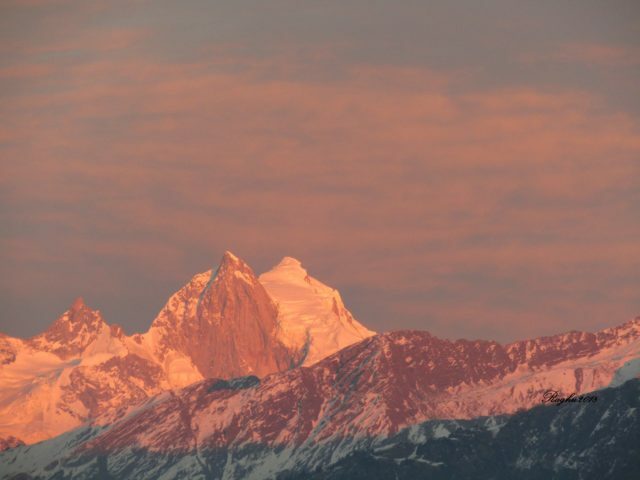 To the east the majestic peaks of Swargharohini is on fire lit by the setting sun. These blazing peaks have deep association with the epic Mahabharatha. It is said, that these were the peaks that the Pandavas climbed during the end of their lives. One by one they fell by the wayside till Yudhshitir and a dog that accompanied him all the way to the peak remained and ultimately reached heaven in their physical form. The cold sweeps down from the mountains and temperatures quickly fall below zero. As we struggle to wriggle into our sleeping bags a bushy, fat black dog pokes its nose through the tent and wags it tail. We can’t resist petting it. As I ruffle through its luxuriant hair I realized how Yudhishthir could have never abandoned that dog. The base camp of Mt. 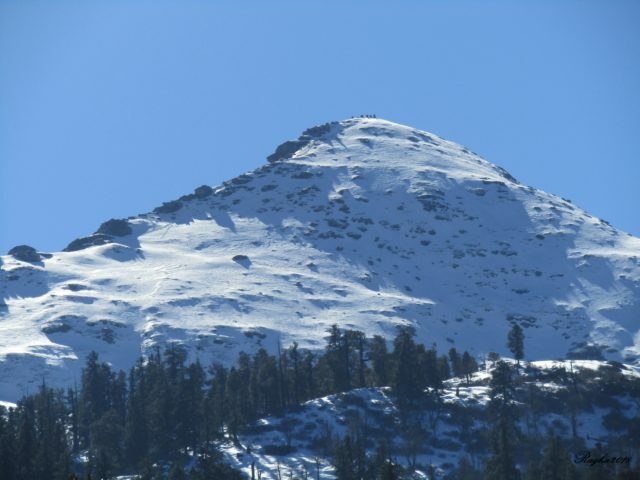 Kedarkantha is situated at 11,200 feet. It is a small makeshift village. Tents of various colors bloom like thousand flowers on white snow. Dozens of climbers are taking a stroll and practicing their steps on deep snow that surrounds the camp. Kitchen tents spew up smoke and ruddy-faced local men sing loudly as they chop vegetables. The base camp is a flurry of activity. Nights here are spectacular. Wispy thin and cloud-like Milky Way splits the sky above. Stars of different hue and shade sprout and shine in splendor. The hunter, the constellation Orion, rises slowly behind Mt Kedarkantha, its sword pointing to the peak and our destination for tomorrow. The climb to the peak starts at 3’o clock in the morning. The cooks fortify us for the climb ahead with a hot bowl of porridge and for people who like it in the early morning, Maggi! The terrain is slippery. Spikes that we wore on our shoes give us traction. Head light and torch light beams crisscross the icy paths that we walk on. 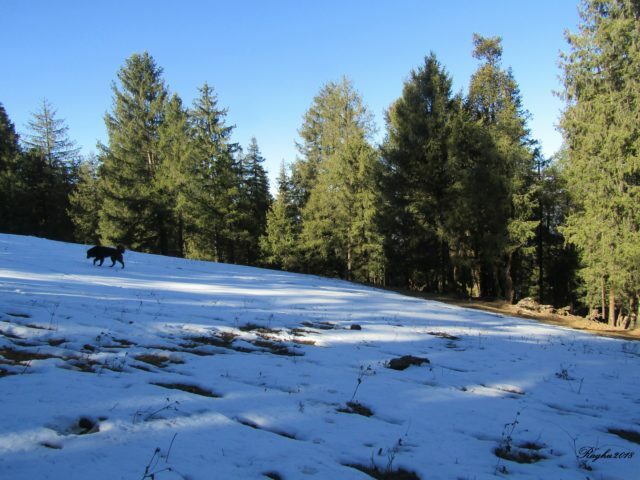 Snow glistens on our side and pine trees stand on both sides like dark sentinels. All that you hear for the next three hours is the crush of ice under spikes, deep breaths inhaled and exhaled and quite conversations by small clusters of climbers as they pause to take a breath. Just as the sun rises we are at the peak. On all sides we are surrounded by the Himalayan ranges. The guide points out to each of them; Kinnaur Kailash, Gangotri, Yamunotri, Har Ki Dun, Bandarpoonch and the Doon Valley. Around us jubilated climbers pose in clusters for photographs that they would cherish for years to come. Amidst all this celebrations, tucked in a corner of the peak is a small statue of what looks like Ganesh. The guide said that the locals called it Neru. It is believed that during times of drought the statue would be placed face down to bring down rains. In India, mountains are considered as abodes of gods. We sent a silent prayer of thanks. The prayer flags fluttered around in the gusty wind and we imagined it taking our prayers to the gods that reside on Mt. Kedarkantha. Sankri is the place where it all starts. It’s around 200 kms from Dehradun. A lot of local guides are available to conduct the trek. You could also pre-book the trip through multiple travel agencies. The trek is described as easy. But for people who are not used to trekking I would put it between moderate to difficult. Mostly because it is very cold and the last leg of the summit is steep. At the base camp and at the summit the temperature can reach to -12 degrees. Do carry as many protective clothing as possible. 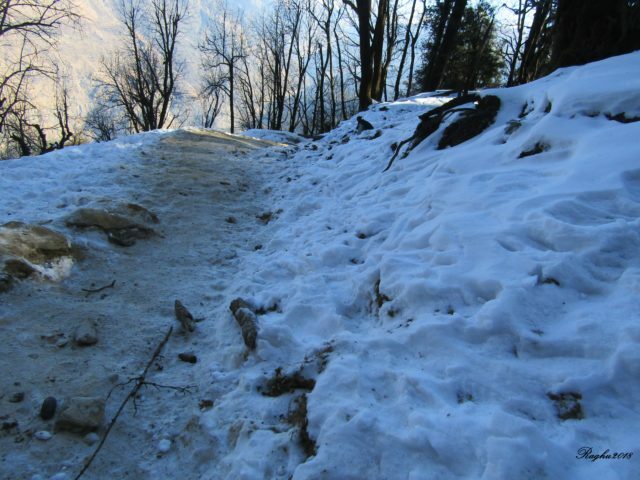 The trek is very popular during the months of December and January and so do expect a crowd. The stay facilities are very functional; tents, sleeping bags and pits dug in the ground for latrines. Don’t forget to take your tissue! Academic. So, would prefer to live amidst piles of musty tomes. But, once in a while, I would wander to not-so-far lands to get drenched with new light, fresh air and exotic food. Yes, and I love to tell tales about these journeys. Good read. Very nice and minute detail of the summit. Enjoyed Reading Such a Nicely Written Travelogue ! Thank You Mr Raghu Raman For Sharing Your Experience. Walking on ice, that too in December? Oh, no! Tell me whether I can do it in June. If not, I shall be happy with going through your wonderful account. These photos are breathtaking! This post makes me want to go to the Himalayas right now!